True to his tradition and the hand of his regular collaborator Aldo Drudi, the Italian presents a unique model that will look during the preseason. The pre-season tests bring many new things and one of them is the image of the helmet that Valentino Rossi will wear. As usual, this edition in Sepang was not going to be an exception and the Italian has not missed his appointment with the new model. The Tavullia has already revealed his AGV Track GP R that will look for this preseason and the hand of his regular collaborator Aldo Drudi, has presented a unique piece painted with a brush where the famous 'Soleluna' that always accompanies the designs of the nine times champion, in addition to a number 46 that gives the feeling of being drawn freehand. The model has not disappointed. 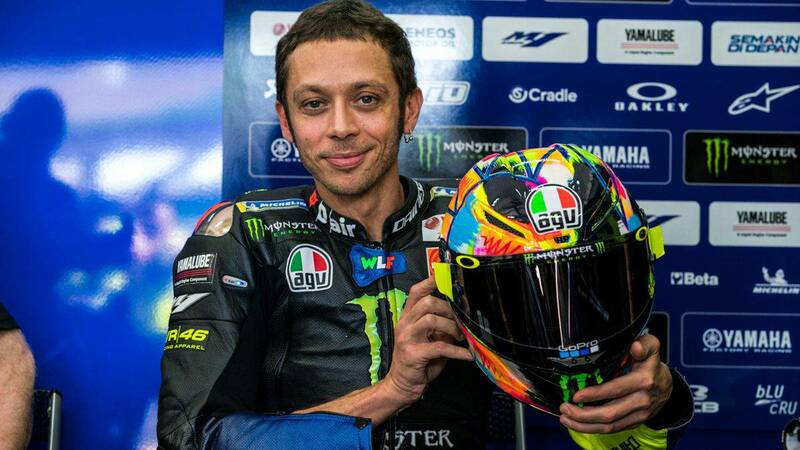 The new helmet has broken with everything that Valentino had presented so far and yet, has managed to keep both the most characteristic elements of his predecessors, and the colors he has always worn in some emblematic designs. The helmet that will wear during the preseason contains the usual yellow that distinguishes the Italian, combined with other garish colors such as green, fuchsia and orange. Despite the passage of time, the ideas and desire are not exhausted although 'El Doctor 'has recognized that "it is not always easy." The proposal for this preseason presented some doubts for its creator, "but then began to have fun" . "Each helmet is unique, because they are hand-drawn" and this exclusivity will make the current design become an authentic collector's item for anyone who acquires it.